Overall print size: 32 3/8" wide x 24.3/4" high. Image size: 26" wide x 17.1/4". 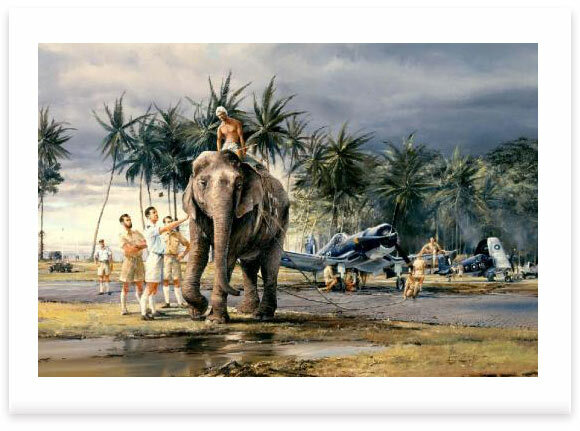 Operating happily in conditions where towing tractors became quickly bogged down, the Puttalam Elephants provided an invaluable service, and became much loved by the pilots and ground crews. This superb piece was originally painted by Robert back in 1984 as a commission for the Fleet Air Arm Museum in Yeovilton, but was never released as a limited edition. Over the years there has been an unprecedented number of requests to see this great image in print - to such an extent that the publisher has now released it. This vibrant, evocative and very unusual piece will appeal to both collectors of Aviation and contemporary art alike. A number of Fleet Air Arm pilots who actually flew the Corsair in the Far East have personally signed the edition and these rare signatures make this a truly unique collectors piece.